One day, after being in the RTO industry for eleven years, Jay Muir wrote down 10 things he would spend his time on if he owned his own store - things he felt would make it a successful operation and accomplish some personal goals. Then he wrote down 10 things he was spending his time on as district manager for a major RTO firm. Not one item matched up. "It was definitely time to move on," he said. "This wasn't what good business was about anymore." It wasn't long after that he decided to go into business for himself as a Premier Rental-Purchase dealer, and he opened his store in Manchester, NH in September. Jay began his career in RTO just out of high school delivering for Rent-A-Center. He moved up the corporate ladder from service representative to assistant manager and endured a buy-out. He managed his first store in Somersworth, NH, and after a successful year moved to Concord, NH where he ran the third most profitable store in the county. After becoming a district manager he took over the most profitable market and ran it for four straight years. It seemed like what he touched turned to gold, but for him it became harder and harder to operate as he knew he could and should. "As I was moving up through the company, I disagreed with the corporate structure. A lot of solutions were cookie cutter for the entire company and not tailored to what actually worked for me in my area. Things didn't operate in my more rural area like they did in a place like New York City, yet every location was treated the same. People were treated the same as well with no adjustments based on skill level. If someone couldn't do a job he or she was asked to do, the position was dumbed down for the rest." A former colleague, John Reichenbach, who was planning and has since opened a Premier store in Westbrook, Maine, called one day and encouraged Jay to look into ownership. Seeing someone he knew getting into his own business gave Jay the urge he needed. "I had always talked about opening an RTO store," he said. "There is great flexibility as an owner." And that is what Jay longed for. He considered several options for franchising and found that Premier allowed him the most flexibility to go out and do what he wanted to do. He also appreciated the benefits of a network that provided such features as health insurance and a payroll department. "I looked at what those activities involved and realized I didn't want to mess with them myself! Premier had a great system in place for these essential but time-consuming aspects of a business, and I needed to concentrate on what I wanted to put in my showroom and who to use as my vendors." Jay wanted to establish a reputation for having good merchandise. He also wanted to take advantage of specials and turn savings over to his customers, which he could do through Premier's buying group. "That makes customers happier, and in turn we are happier." As part of the Premier network, Jay feels support rather than competition, enabling him to focus further on what matters rather than having to continually jockey for position or promotion. 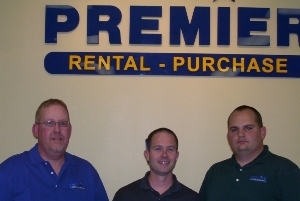 "Everyone at Premier is here to be successful and make money. There is no backstabbing. And it doesn't matter what the other guy is doing down the street. All of us Premier dealers will send him an email to help him out, whether it affects us or not." With a well-crafted business plan to guide him, the financing to launch and the support systems in place, Jay can now concentrate on what has made him a success in RTO so far - customer care. One of his two philosophies for business is this: "Be nice to people; do what you say you'll do. When you do that," he says, "people tend to come in and pay you and bring their friends. My job is to get them to own the merchandise they signed up for. I don't make money putting things back on the truck. I therefore preach open communication. My customers know to call me and tell me what I can do, and we work on solutions to anything that comes up." Jay's second philosophy is to "surround yourself with really good people who want to do their job and move forward. I promoted six guys to store managers when I was in Concord. I work hard to find the right people and get them into a job they can do well and enjoy." He adds that two "really good people" he is privileged to partner with in his new store are Mike Stringer, former district manager for RAC and Mark Allen, former store manager for RAC. In addition to the satisfaction of owning his business now, Jay feels he is in a position to do things he couldn't do as an employee on an overloaded schedule - like coach his son's little league team. While he is initially working harder than ever to get underway, he has found the flexibility he was aiming for. He admits that is really the biggest benefit of being a dealer. "I ultimately wanted to do things with my family. My wife knew I wasn't happy. I would wake up in the morning not wanting to go to work. Now I'm hopping out of bed to get to work because I know it's all for my family and me. I am very comfortable with RTO; I feel I'm good at it. But I like doing it my way. And liking what you are doing is as important as being good at it."